Obituary for Josephine B. May | Kaniewski Funeral Homes, Inc.
Josephine B. May nee Glista age 96. 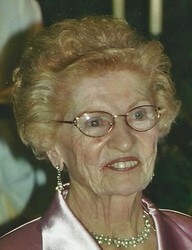 Beloved wife of the late Frank May Sr.
Loving mother of Barbara McCauley, Carolyn (Dennis) Umprovitch, Frank Jr. (Patti) May, Bernard (Hannah) May, Daniel (Patti) May, Veronica (Martin) Lebbin and Roberta (Randy) Polovick. Cherished grandmother of 18 and great grandmother of 26. Dearest sister of the late Ann Marie (late Peter) Kezon, late Sr. Mary Paschalita CSSF and the late Edward (late Dolores) Glista. Aunt, cousin and friend of many. Retired employee of PNA and member of the PNA Lodge #2727. Long time active parishioner at St. Richard Church. Funeral Friday 9:15 am from the WOLNIAK FUNERAL HOME, 5700 S. Pulaski Rd., to St. Richard Church for Mass at 10:00 am. Interment Resurrection Cemetery. Visitation Thursday 3:00 pm to 9:00 pm.